"I loved seeing teachers nurtured and honored... I was inspired by the thoughtfulness of the planning and the structure of the Institute... The entire six days were amazing and exceeded my expectations in every way!" "This was the most organized, supportive, informative, respectful, enlightening workshop I can ever remember attending. There was complete and effective use of our time. Provided so many resources and (so much) support. Thank you! The participants were equally wonderful. It was an honor to be here." "What I learned from this week about feminism, education, etc. I will carry with me forever in my own teaching." "I never had a class before that I was actually dreading leaving!" "This was an amazing course that has inspired me to not only teach about The Dinner Party in my classroom, but share information with my colleagues, both a teacher in another district who will be teaching a course on The Dinner Party and hopefully with my own department of art teachers via in-service." "Amazing. Life-changing inside and outside the classroom." "There is a lot of walking the talk going on—from leadership through to the students." "Thank you for elevating the conversation again and again." "Personal, comfortable, open dialogical community established from the first moment we walked in and began eating!" "I am so inspired to go home and start teaching feminist pedagogy to friends and using it in my classes and leadership! Thank you!" 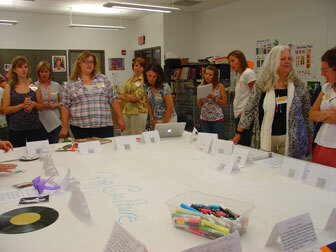 "The opportunity to meet so many passionate and committed art educators." "It's an excellent idea to have a class purely dedicated to women's achievement in history and to really explain the concept of feminism. In all the years I've been in school (for most of my life), I have never been taught, in an educational environment, what feminism means or even what women have done throughout the course of history." "I am inspired to follow my passion in whatever that may be—and to be successful in my life. I have finally found some women role models to look up to." 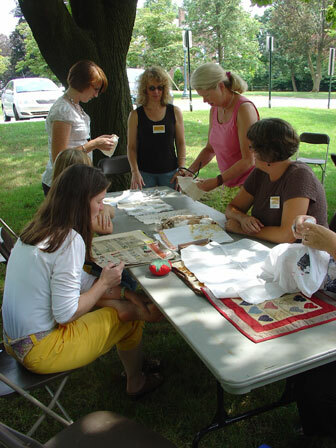 Participants study various examples of handwork and organize them chronologically. Extending the invitation display. Participants selected other women and "invited" them to join the others at The Dinner Party table.